Finally, the title of Imtiaz Ali's film, starring Shah Rukh Khan and Anushka Sharma, has been revealed - it's Jab Harry Met Sejal. The title is quite similar to the director's 2007 film Jab We Met starring Shahid Kapoor and Kareena Kapoor Khan. 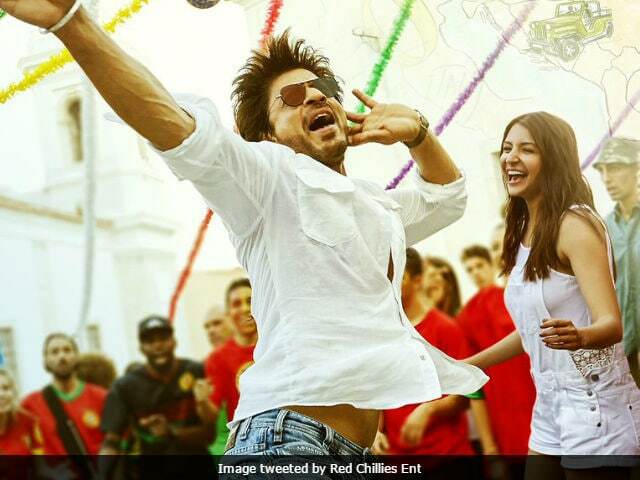 Shah Rukh Khan's Red Chillies Entertainment, which has produced the film, tweeted two posters of the film on Friday, which gave away the film's title in two parts. The posters also reveal a lot about the film. Both posters feature the protagonists looking extremely happy and full of life. The world map in the background suggests that the film has a lot of globetrotting too. Jab Harry Met Sejal has been extensively filmed in Budapest, Prague and India. SRK and Anushka filmed in the foreign locations first and then moved to the mustard fields of Punjab, India. Anushka was also spotted filming in Mumbai with Imtiaz Ali minus SRK. Jab Harry Met Sejal is Shah Rukh and Anushka's third collaboration after Rab Ne Bana Di Jodi (which was also Anushka's debut film) and the Yash Chopra-directed Jab Tak Hai Jaan. Shah Rukh also had a cameo in Anushka's Ae Dil Hai Mushkil but they did not have scenes together. Anushka is also reportedly collaborating with SRK in Aanand L Rai's film in which Shah Rukh plays a dwarf. The film will also feature Katrina Kaif - it will be a Jab Tak Hai Jaan reunion of sorts. Jab Harry Met Sejal is expected to release on August 4.